In its quest to make its laptops smaller, lighter and faster, Apple has made modern MacBooks harder -- if not impossible -- to upgrade. Take my mid-2013 MacBook Air for example. It comes with an SSD design for which there are only a handful of aftermarket options around -- and the cost of buying new storage may be higher than what my laptop is now worth. Some newer MacBooks are even worse though, leaving no such option on the table. TarDisk is a very interesting alternative to the replacement route. It fits into the SD card slot and can be used either as an external drive, that you would not even know is there, or as combined storage. In the "Pear" mode, as TarDisk calls it, the internal drive and the TarDisk are merged, giving you a single drive with their combined capacity to play with. And, unlike a replacement drive, it does not put your warranty at risk. That is probably the most appealing thing about it, because if your MacBook is still under warranty there is no good reason why you should risk it to bump up the storage capacity. A replacement drive, due to its nature, requires that the MacBook is disassembled and the original drive removed. TarDisk, when used as an external drive, can be easily removed from the SD card slot. Even if you choose to go the pairing route, you are not messing with the hardware to give Apple reason to void the warranty. The combining of storage happens at the software level, and can be undone if you want to remove the TarDisk. 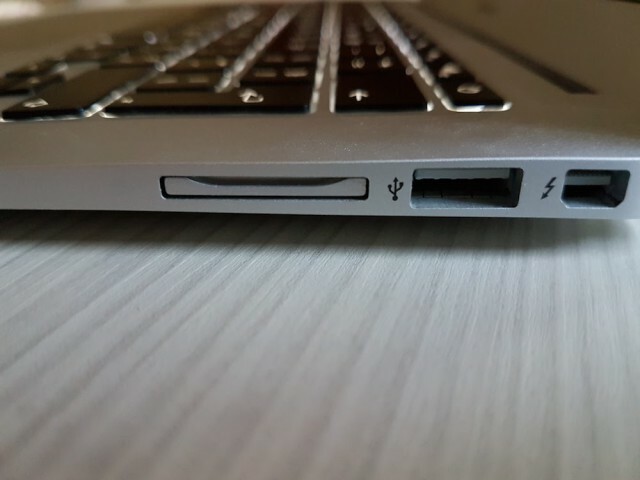 Due to its design, the TarDisk is designed only for MacBooks with an SD card slot. The list includes the 11-inch and 13-inch MacBook Air, the old MacBook with a CD slot, and the MacBook Pro with a Retina display (mid-2012, early-2013, late-2013, mid-2014 and mid-2015). Speaking of storage, there are two models available. There's a 128GB TarDisk and a 256GB version. No matter which one you go with, its capacity will be added on top of what your MacBook offers. In the case of my mid-2013 MacBook Air, which has a 256GB SSD, I ended up with 512GB of storage after installing the 256GB TarDisk in pairing mode. Pairing the internal drive and the TarDisk requires minimal input. You have to click a few buttons and let the MacBook restart to use the device in pairing mode. It comes with an app which takes you through the whole process. Like I said earlier, you can use it just like you would any other external drive, and it will work just fine. The main benefit of merging the storage is that you do not have to worry about where the files are and how much space there is left on one drive or another when installing apps or transferring content, for instance. Normally, you would have to move files around when one drive is nearly full to make room for more. The downsides are clear: the SD card slot is out of action and you need to go through a couple of steps before the TarDisk can be safely unplugged. For me, since I do not rely on SD cards, that is not a problem. And neither is the removal process, which is easy to perform. TarDisk says that the drive also can be used in pairing mode with virtual machines. If you use virtualization software like Parallels, the company says that you can pair the TarDisk and the drive of that macOS VM and enjoy it just like you would on a physical MacBook. It does not, however, work with BootCamp. What's TarDisk like to use? In a word: you do not even know it's there. After turning on the pairing mode, the TarDisk performed without any issues whatsoever. Everything that was there before the installation was available afterwards as well. Performance remains just as good, based on my experience. 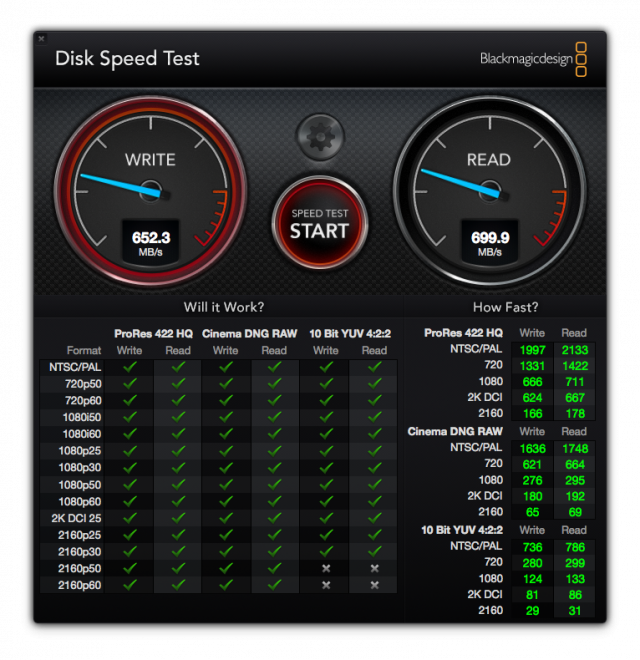 I have not performed any benchmark testing prior to installing the TarDisk, so I cannot say what sort of impact it has in terms of storage speeds, but the results that I got from Blackmagic Disk Speed Test show write speeds of around 650-660MB/s and read speeds of around 700-710MB/s. Everything seems to open just as quickly as it did before, with no hiccups to speak of -- none that I did not encounter before, that is. I did not start with a fresh installation of macOS Sierra either, so, overall, I am really pleased with the results. To spot a MacBook with a TarDisk that is Pear-enabled you can open "About this Mac" and look at the Storage tab. There, you will see two drives, both offering the total capacity of the setup but with two different storage capacities listed underneath. You can see how it looks below. The second is the internal SSD, and the first is the TarDisk. 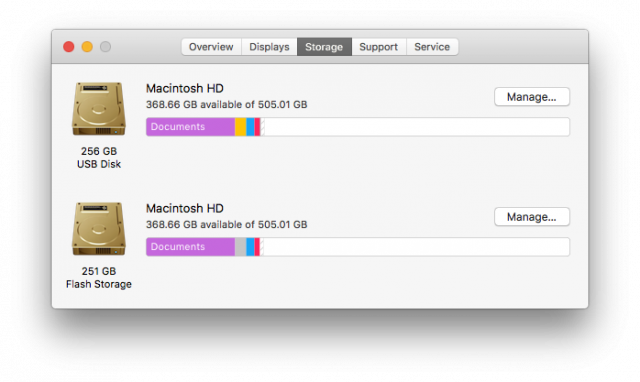 Apple's configuration takes a bit of space from the drive to give you a recovery partition but, as you can see, there is just over 505GB of usable storage available -- out of the 512GB in total. Not bad. To answer the question, let's talk about price first. TarDisk, in a 128GB configuration, costs just $149. That is a small price to pay, in my opinion, to add 128GB of usable storage to a MacBook. However, the 256GB version is priced at $399, which is more than two and a half times as expensive for twice the storage. The experience that TarDisk provides is faultless though, and that is what ultimately matters if you like the design. Aftermarket options can cost more for the same capacity that TarDisk enables, so I think that, looked at in this context, it is good value for money.